Purpose: To to translate the knowledge we have gained in the Oral Care in Continuing Care Settings project in order to facilitate uptake of these resources in other relevant settings. 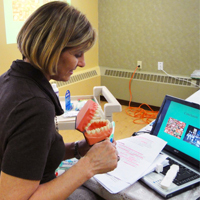 This knowledge translation (KT) project follows from outcomes and KT activities arising from the Oral Care in Continuing Care Settings: Collaborating to improve polices and practices (2008-2012) study funded through the Nova Scotia Health Research Foundation. The study involved an extensive network of decision makers and knowledge users across Nova Scotia. More than 30 presentations were made to share findings and showcase the educational resources. As a result, there has been an overwhelming and urgent demand for these resources from across Canada and internationally. Where will these oral health resources be shared? continuing care assistant education programs. We will also share our resources nationally by connecting with dental associations, relevant health sectors, and others with a known interest in care for dependent older adults. How will these oral health resources be shared? The “Brushing Up on Mouth Care” resources will be modified to ensure relevance to the three target audiences. A nurse educator will work with the project coordinator and content experts from the research team and the continuing care and education sectors to develop a facilitator’s guide. Based on a train-the-trainer approach, the facilitator’s guide will provide an education plan and teaching tools to assist potential facilitators to train care staff about oral care and to how to use the ‘Brushing Up on Mouth Care’ resources to improve oral care. Physician Leaders and Directors of the Care from Continuing Care sector in Nova Scotia will identify prospective facilitators from within each of the long-term care facilities, home support agencies and Continuing Care Assistant education programs across Nova Scotia. A nurse educator will lead several train-the-trainer sessions across Nova Scotia. Training sessions will include hands-on demonstrations of proper brushing, flossing, and rinsing techniques, as well as approaches to manage challenging behaviours. These sessions will also be delivered in a webinar format for facilitators who are unable to attend a live training session. To enable the sharing of knowledge beyond Nova Scotia, webinar sessions will be available and advertised to a national audience. Finally, this training session will be developed into an educational video and posted on the project website along with the facilitator guide and all other ‘Brushing Up on Mouth Care’ materials.